Billerica, MA, October 19, 2017 – OrboGraph, a premier developer and supplier of intelligent electronic/paper automation solutions in healthcare revenue cycle management (RCM), as well as recognition solutions, image validation and check fraud detection for the U.S. check processing market, was recently profiled in the September release of The TECHNOLOGY HEADLINES as a Top 10 Leading Healthcare Solution Provider. The newest addition of The TECHNOLOGY HEADLINES includes an impressive list of innovative companies that are at the forefront of quality-driven products and services. A direct link to the article is available for viewing here. 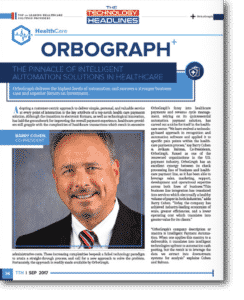 OrboGraph and its cloud-based OrboAccess platform was selected for its ability to streamline insurance and patient payments by automatically converting scanned images of Explanation of Benefits (EOB), patient coupons and correspondence letters into EDI 835 files to ease manual posting labor. Additional modules streamline payment reconciliation and analyze denied claims analytics. Hospitals and physician groups are looking to achieve 100% EDI (electronic data interchange) adoption of payments and remittances from all insurance companies. Most providers are unable to achieve this goal because of the cost and labor overhead for setup, testing and implementation of EDI 835 files. The entire version of the September magazine can be viewed here. OrboGraph (www.orbograph.com), a subsidiary of Orbotech, is a premier developer and supplier of intelligent electronic/paper automation solutions in healthcare revenue cycle management (RCM), as well as recognition solutions, payment negotiability and check fraud detection for the U.S. check processing market. The company mantra, “intelligent payment automation,” describes how intelligent technologies are applied so payment posting becomes an automated process and information is accessed and analyzed via a variety of business intelligence, analytics and user interface capabilities. Nearly 2,000 financial institutions, service bureaus, clearinghouses and billers rely on OrboGraph technology to process billions of checks, EOBs, correspondence letters and claims annually.